Editor’s note: This story was originally published by HIAS. 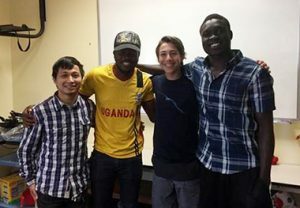 “Anyone can play, our demographic is very diverse,” Ta Kwe Say proudly tells HIAS.org. 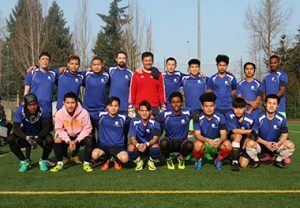 Say, originally from Burma, is a resettlement case manager at Jewish Family Service, and the team manager and driving force behind JFS FC, a recreational outdoor soccer team formed in the summer of 2017. By Say’s estimation, the team is comprised of 90 percent refugees resettled to the Greater Seattle area, and also includes a handful of JFS clients and staff. After Say got approval from his supervisors to move forward, a JFS board member’s son got involved and dedicated his bar mitzvah project to fundraising for equipment such as jerseys, shoes, soccer balls and shin guards. Say then signed the team up for the Liga Atzeca in Kent in their middle division. This spring, after being eliminated from the league championships in the quarterfinal in a penalty shootout, the squad won the consolation tournament in March 2018. Finding time to practice during the week can be challenging, but a consistent group of players ranging from high school aged to their early 30’s shows up on gameday. Team members and a JFS board member’s son, who dedicated his bar mitzvah project to fundraising for the team. Zaki, a high school junior originally from Somalia who played forward for JFS FC this season, says he enjoyed the different cultures, the different people from different countries, and how he got to know his teammates through how they play the game. As the team’s manager, one of Say’s roles is also to manage playing time during the games, which involves a measure of diplomacy. “Sometimes they want to keep playing and don’t want to come off,” he notes with a laugh. Ultimately though, JFS FC is about more than improving soccer skills and getting exercise, it’s about building relationships. “People can get stuck in different groups, so it’s good to have friends coming from different backgrounds—to have a larger network outside of your immediate circle,” says Say. Kevin, one of Zaki’s high school teammates from Vietnam who played central defense for JFS, echoes the sentiment. ← What Is a Sensory Overload?